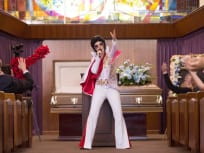 Schmidt plots to ruin Cece's wedding, while Nick and Jess consider their relationship, on the season finale of New Girl. Nick and Jess must deal with an unexpected visit from Jess's father on New Girl. In a series of flashbacks, the group recalls how each of them lost their virginity on New Girl. Jess's surprise bachelorette party for Cece does not go exactly as planned on New Girl. Jess and Nick finally go out on a date on New Girl. Jess realizes she still has feelings for Nick on New Girl. It's all-out war when the roommates each want to claim an amazing parking space as their own, on New Girl. Jess and Nick deal with the fallout from their kiss this week, while Cece (and everyone) attends an Indian marriage convention. 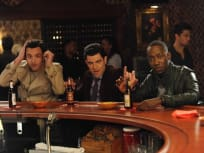 On New Girl, on a guys night outing, Nick and Schmidt both fall for the same woman while Jess plays a drinking game that ends with a new development in the relationship with one of her roommates. Nick believes one of Jess' students has a secret and Winston and CeCe suffer an embarrassing incident on New Girl. 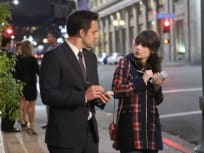 When Nick's father returns, Jess tries to help them reconnect but Nick is worried his father is involved in a scheme on New Girl. On New Girl, Jess invites Nick and Angie away for the weekend with her and Sam but things get quickly become uncomfortable. When Jess runs into Sam at a holiday party, she tries to convince him that she's now dating Winston on New Girl. On New Girl, Winston and Jess decide the loft needs a bathtub while Schmidt must decide between his boss and CeCe. When they hear a friend is pregnant, Jess and CeCe become concern about their own biological clocks and Schmidt works towards making Emma happy on New Girl. 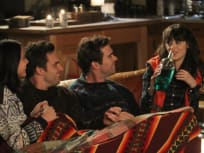 Jess gets Schmidt to help her with a "Parent Trap" type strategy to get her estranged parents back together over Thanksgiving on New Girl. Schmidt begins a relationship with his boss while Jess' job hunt gets more serious on New Girl. And Winston has PMS. 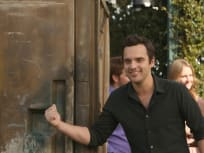 Jess finds work as a zombie at a haunted house while Schmidt and Cece and Winston and Shelby have relationship issues over their respective Halloween costumes on New Girl. On New Girl, Jess steps in for CeCe when she can't make a modeling job at a car show. Nick and Schmidt debate the rules of male friendship. When a group of young twentysomethings move in across the hall, Jess and Schmidt try to make friends while Nick tries his best to make Schmidt feel old. On New Girl, Schmidt pretends to be one of Mitt Romney's sons in order to impress an attractive Republican. Nick and Jess reevaluate their relationship. On New Girl, when a handsome man mistakes her for his blind date, Jess plays along. Winston's mother visits along with Winston's sister, who Schmidt hits on. Nick thinks a customer at the bar is him from the future. On the season premiere of New Girl, Jess is laid off and becomes a shot girl at Schmidt's re-branding party. Parker Posey guest stars. I panicked and I grabbed the hat. I should have grabbed the yoyo or the slap bracelet and now all I have is this stupid hat.